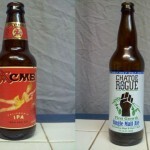 On this episode we announce the reboot of The Beer Snobs and give our first blind reviews for Chatoe Rogue Single Malt Ale and North Coast’s Acme California IPA a chance at seeing which is worth spending your money on. Enjoy this special holiday weekend release of the brand new show, and you can expect all future episodes to be out every two weeks week on friday! Posted in Blind Taste Testing (2011 - 2013) and tagged ACME, Ale, beer, blind reviews, holiday weekend, Hophead, IPA, malt ale, money, north coast, Organic Beer, reboot, return, snobs.